In prewar/wartime Japan, and postwar Japan to some extent, the clothes, especially women’s, convey various implications as to the social/cultural roles, status and psychology of the character. This implication is clearly evident in Ozu’s films. 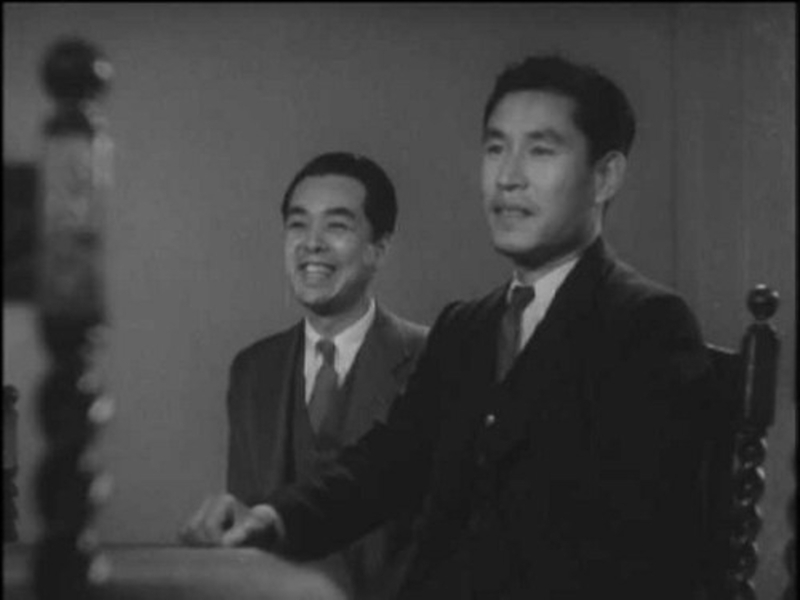 In Ozu’s prewar, wartime films, majority of female characters wear kimonos, while male characters are dominantly in western clothes. However, after the war, the (young) female characters are completely converted to the western dress, as can be evidenced by “Late Spring”. Noting that “Late Spring” and “There Was A Father” or “Brothers and Sisters of the Toda Family” are only less than ten years apart, it is all the more surprising. Take, for example, progression of Setsuko Hara’s roles in the films and her wardrobes. Before and during the war, most of her roles called for kimono (Kouchiyama Soshun, Hawai Mare oki kaisen, Atarasiki Tsuchi etc.). But immediately after the war, majority of the characters she played barely wore kimonos, mostly western dresses, as can be evidenced by Noriko series in Ozu, a couple of Kurosawa and other films. These characters were more open to society, active in public space and a conscious individual. However, this transformation completes in a full circle, as her roles in the later films are domestic mothers and widows, wearing again kimonos. Another example is Kuniko Miyake, whose carrer in the film spun from 30’s to 60’s. In 1930s she played female leads in many Shochiku films, many of which were working women, requiring the western wardrobe. Then, as she progressed in age, playing domestic mothers/wives in “Ohayo” and “Late Autumn”, for example, as kimonos glued her onto tatami. This coding of clothes, kimono as domestic versus western clothes as “public”, is consistently seen in many Japanese films over the years. And to some extent, this coding applies to male characters, too. Mamiya, Taguchi and Hirayama all wear expensive suits or shirts in an office, a bar, in a club house until they slip into something comfortable at home. In “Late Autumn”, there are many scenes the middle aged men changing their clothes to kimono immediately after they come home. Setsuko Hara in Hawai Mare Oki Kaisen (1942). This is not exactly a kimono, but “monpe”, domestic clothes for women during the war. Because most of the characters are in “public” most of the time, appearance of kimonos in domestic environment in “There Was A Father” is all the more revealing. For example, Fumi (Mitsuko Mito) wears kimono only and Hirata (Takeshi Sakamoto), her father, is seen wearing kimono at home (and in good spirits, too). Ryohei (Shuji Sano)’s verbal expression of his wish occurs only when he is appreciating the private time-off with his father, in kimono. In the next morning, when Ryohei apologizes for his “selfish” remarks, he is back in the dark suit. Private thoughts are “selfish”, and men should behave. Strangely, this resonates with the philosophy, moral teachings of the time. Overt dominance of male characters in this film is also reminiscent of wartime sentiment. In this six minute segment, there are two female characters appear, but they are just bit parts. It is as if Ozu was at loss as to create female characters in the time like this. Along with Fumi’s characterization, Ozu must have abandoned to paint the domestic passive femininity anticipated by reactionary moral of the time. Considering the fine portlait of women evidenced in such films as “Women of Tokyo” and postwar films, this dislocation of sexual balance is all the more striking. Mizoguchi also drifted into male dominant world of “Chusingura” this year. He immersed himself in the aesthetics of the extravagant set of the Edo Castle. They seemed to have had some way out around this time. As the war progress, there was no way out.